There are approximately 5,690 hospitals currently in the USA, which means that there are more than 5,500 groups of well-educated professionals struggling with the dilemma of how to keep the Operating Room (OR) preference cards accurate and current. Hopefully, the vast majority of those OR Departments have migrated to computerized scheduling and documentation systems that include automated preference cards for each surgeon and procedure. 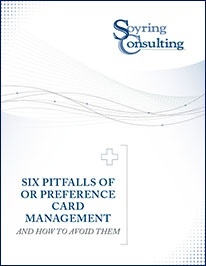 If electronic preference cards are integrated or interfaced with other pertinent information systems (Materials Management, SPD, and Biomedical), then the job of optimizing and maintaining the preference cards will be easier as long as the six pitfalls discussed here are avoided. What are these six pitfalls, and how can we avoid them?